I rented the Capt's house for the last weekend in August 2018. It was for my husband and I as I was working on Shelter Island, NY that weekend. The house/apartment is located in a convenient part of Greenport, NY. 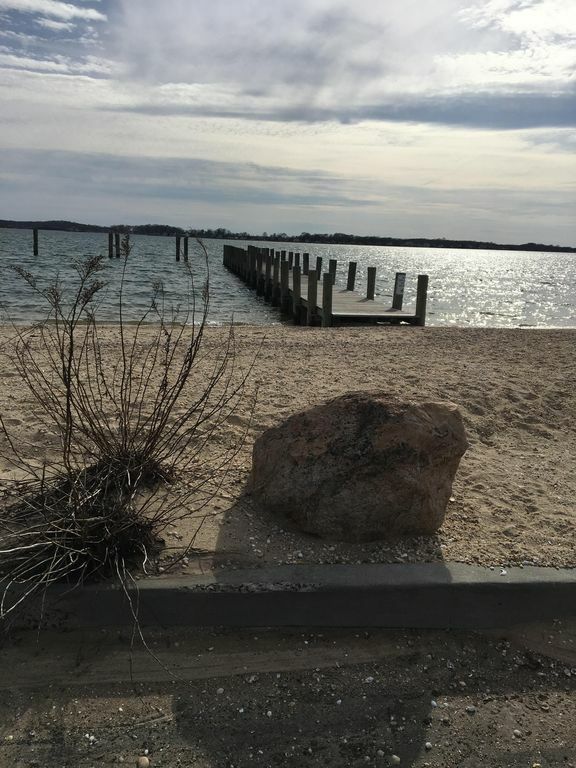 Close to the SI ferry, beach at the end of the block (walking distance), and you could walk to the heart of Greenport village in about 10 minutes. The house/apt was clean, spacious, and had everything we needed. There was a lovely back deck to enjoy the summer evening, porch area containing bicycles and racquets, and a laundry room should you need it. One thing I will note is that the mattress in the bedroom was extremely comfortable. I generally sleep miserably when I travel, but I actually slept well. Huge bonus in my book! The Capt was easily accessible via text/phone and responds immediately. He was friendly and accommodating. Flexible with our check out time. There is a tenant who lives in the upstairs part of the house. He was friendly, super quiet, and we only saw him one or two times randomly during our stay. I would definitely recommend staying in this location. Great 3 room apartment, plenty of room! Your apartment is lovely. Great looking kitchen, with the welcoming bottle of wine and beer, were greatly appreciated! Plenty of room all around, and although we didn't use the bikes or the porch, it was a great addition to have available. Just a few things I might recommend...we ran out of tissues and there wasn't a spare box available, so I used my own tissue packets when necessary. I thought there would be an iron available, but I wasn't able to find it. Again, no biggie, but would have like to have pressed my husbands clothes before we went off to a wedding. And, perhaps offer wi-fi and a guide for the tv stations that are available. None of these are deal-breakers, but for those of us that use VRBO's often, these amenities are nice to have! Overall, it's great apartment - we enjoyed our visit! Great place for a Greenport get away. Comfortable and accommodating to our needs.close to ferry and walking distance to town. Enjoyed. My friends and I stayed in Captain's Quarters for a weekend visit. The accommodations were clean and well appointed. The sofa bed was surprisingly comfortable. The host was very hospitable, leaving us some beer, wine and crackers. A 15 min walk to town so we could ditch the car. Would recommend to others. Jane and her friends were the best guests ever we would love to have them come and stay with us anytime! Great stay in comfortable apartment. Very comfortable stay. Great location for exploring. Loved the relaxed atmosphere of Greemport. Lovely restaurants. Our family of 4 had a thoroughly relaxing time.